Capitol & Main: Will Growers’ Demand for Wage Cuts Get Help From U.S. Government? California growers have complained of a tight labor market for years. And President Trump’s dispatch of military units to the border, along with a decade of deportations, have tightened that market even more by restricting the flow of migrants into the fields. This recipe for confrontation has produced an escalating legal battle in Washington, D.C., and a walkout by hundreds of tangerine pickers in the Central Valley. Growers have increasingly turned to H-2A visas for guest workers as a remedy, with the decade ending in 2018 seeing a more than 370 percent increase, with no decline in sight. Although some growers have signed union contracts and provided better wages and benefits in order to attract a stable workforce, others are not happy with the federally mandated pay rates for guest workers — and are actively seeking to hold wages down. The National Council of Agricultural Employers, a growers’ lobby, filed suit this month against the U.S. Department of Labor to freeze the wages of H-2A workers at a level barely above the minimum wage. Growers recruit guest workers every year from other countries, mainly Mexico. They’re given visas for less than a year, requiring them to work for the employer who contracts them. They must leave the country when their work is done. Growers have to advertise for local workers first, and can only bring in guest workers if no local workers are available. Companies using the H-2A program must apply to the Labor Department, specifying the work, the living conditions and wages workers will receive. Each year the federal government sets the wage that growers must pay H-2A workers on a state-by-state basis. This wage, called the Adverse Effect Wage Rate, is set at a level that supposedly won’t undermine the wages of local workers, but it’s usually just slightly above the minimum wage. In 2019 the wage in California, for example, is set to increase from $13.18 per hour to $13.92. California’s minimum wage, for employers with more than 25 workers, will go to $12.00. On January 8, the day before the new H-2A wages were to go into effect, the growers’ lobby was denied a temporary injunction to halt the increases. The organization then filed its suit to roll back guest worker wages to last year’s levels. Michael Marsh, president of the growers’ lobby, said the increases were “unsustainable” and would cost growers “hundreds of millions of dollars.” Agribusiness is being “hammered by unfair retaliatory tariffs,” he charged, in a dig directed against Trump’s trade war with China. The wage increases directly affect a sizeable chunk of the farm labor workforce. The Department of Labor’s National Agricultural Workers Survey, the best analysis of farm worker demographics for over two decades, says there are about 2.5 million farm workers in the U.S., with about three-quarters of them born outside the U.S., and half undocumented. Last year growers were certified to bring in 242,762 H-2A workers – a tenth of the total workforce and a rapidly rising number. Holding down their wages would save growers a lot of money.Farmworker Justice, a Washington, D.C.-based advocacy coalition, says the average annual income for farm worker families is between $17,500 and $19,999. A quarter of all farm worker families earn below the federal poverty line of $19,790, the coalition says. While the suit would have a national impact, it is closely connected to California growers. President Tom Nassif of the California-based Western Growers Association belongs to President Trump’s agricultural advisory board, and prominent WGA member Dennis Nuxoll sits on the NCEA executive committee. NCEA President Michael Marsh was CEO of Western United Dairymen and an officer of the Almond Board of California, both headquartered in Modesto. Farm worker advocates worry that the Trump administration’s Labor Department may not vigorously defend the wage increase against the growers’ legal challenge. The suit is one of a number of moves growers have made in the past two years to roll back H-2A wages and protections. At the behest of the Washington state Farm Labor Association, one of the largest H-2A labor contractors, the state and federal labor departments effectively slashed the AEWR wage for H-2A farm workers by up to $6 per hour. The two agencies agreed with the labor contractors to remove a piece-rate minimum for picking apples, the state’s largest harvest, effectively lowering the harvest wage by as much as a third. The assault on farm worker wages has also surfaced in Congress as Republicans in the House and Senate introduced bills in the last two years to end protections for H-2A workers and expand their recruitment. Republicans representing California’s San Joaquin Valley in the House supported these bills, which failed, but two of those representatives were turned out of office in the midterm elections. What attitude their new Democratic replacements will take has yet to be seen. Some California Democrats, however, especially Senator Diane Feinstein, have a record of supporting growers’ use of the H-2A program. Senator Feinstein and Democratic Representative Zoe Lofgren, however, have reintroduced a bill, the Agricultural Worker Program Act of 2019, which would allow undocumented farm workers to gain legal status by working a minimum number of days, pass security checks, and meet other requirements. “The bill would minimize the need for employers’ use of the H-2A guest worker program by providing a meaningful opportunity for immigration status for the hard-working undocumented farmworkers who put food on our table,” said a statement from Farmworker Justice. Grower efforts to cut wages have affected workers who are not H-2A visa holders as well. Low wages for farm workers have already provoked a strike this year at one of California’s largest agribusiness corporations, the Wonderful Company. On January 11 an estimated 1,800 field hands refused to go to work harvesting tangerines in Kern County orchards, after the piece rate they were being paid was lowered from $53 to $48 per bin. Striking pickers told reporters that a fast worker could harvest two bins a day. Assuming an eught-hour day, they would earn about $12 per hour. Some workers told UFW organizers that they often made less than the $12 per hour legal minimum, a violation of state law. Wonderful spokesman Mark T. Carmel said in a statement the company was “disappointed that some of our third-party labor contractors decided to protest at one of our fields.” A month ago, however, the company said it was raising its wages to a $15 per hour minimum in all its subsidiaries. The Wonderful Company was known as Paramount Farms until it changed its name in 2015. Paramount Farms had a long history of labor conflict. In 1999 it broke an effort by a thousand workers to join the Laborers Union in its huge packing plant near Lost Hills on the west side of the San Joaquin Valley. At the time the company issued a press release saying that “employees are doing well and do not need a union,” and that its pay and benefits “are superior to most employers in the area.” In 2002, however, the National Labor Relations Board ruled that it had illegally threatened workers with firing, and had illegally fired two workers, Margarita Aviso and Leticia Ortiz, for supporting the union. UFW secretary-treasurer Armando Elenes felt workers had taken a big step. “They came out of the strike with real leaders and a good organization,” he said. The strikers are mostly indigenous Mixteco migrants from Oaxaca. 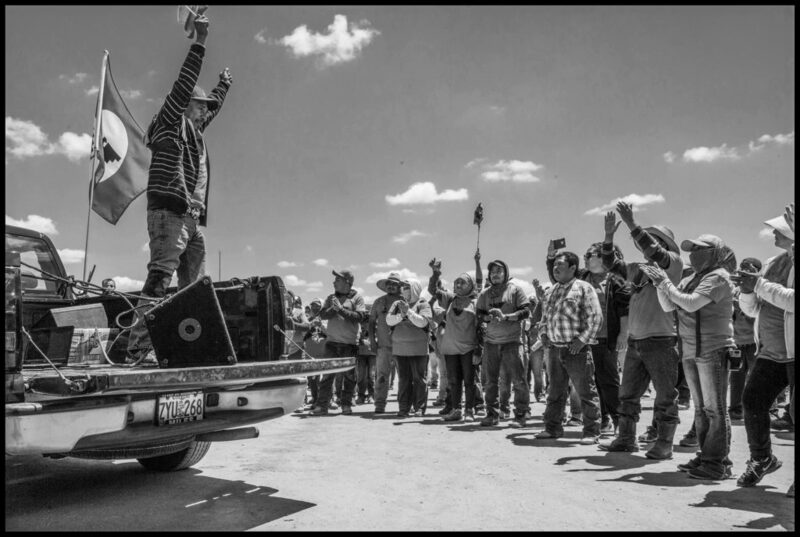 Two years ago workers from the same indigenous farm worker community struck the Gourmet Trading Company’s grape vineyards, also over a cut in wages. They then voted for the UFW in a union election, and the company agreed to a union contract covering over 500 employees.